Former Illinois Gov. 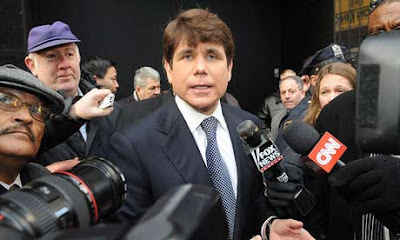 Rod Blagojevich was indicted Thursday on federal corruption charges. Blagojevich and five others face charges that stem from attempting to auction off President Obama's U.S. Senate seat after he vacated it on the way to the white house. Blagojevich faces 16 counts on an indictment that alleges that he talked about possibly joining Barack's presidential Cabinet or receiving a very lucrative job, in exchange for the Senate seat. He's also been charged with illegally refinancing state pension funds in order to receive a kickback after he left office,illegally pressuring congressman for fund raising assistance, and lying to Federal agents. Blagojevich was impeached earlier this year and removed from office on January 29.